Drift 3.0: back to cause more sonic chaos. We were getting a little bit worried about Sinevibes - it had been at least a week since its last new plugin update or release. Normal service has been resumed, though, with the announcement of Drift 3.0, an updated version of the company's 'chaos processor'. This is based on two independent 'Lorenz chaos systems' - three dimensional oscillators that are used in science to model convection in liquid and gases. In this this case, though, "these random but smooth signals are used to modulate spectral effects, sound level and stereo pan, giving them the dynamic characteristics of wind gusts, air turbulence or rising water bubbles." The plugin's colour-coded interface features 2D representations of the chaos systems and subtle animations for all controls. 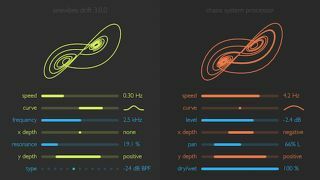 Find out more about Drift 3.0 on the Sinevibes website, where a demo can be downloaded and it can be purchased for $29. It's available as a 32/64-bit AU plugin for Mac.